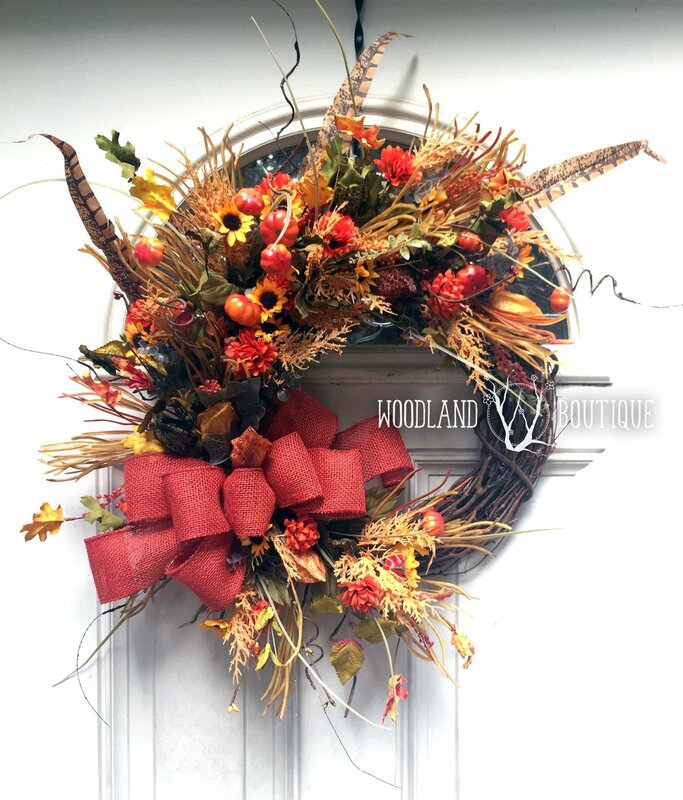 Handmade Fall Wildflower Wreath measures approximately 24″ tall, 20″ wide and 6″ deep (with a few wispy tendrils that extend beyond those measurements.). This wildflower wreath boasts “fall-ish” hues of orange mini-mums, cheerful yellow blooms (they remind me of coreopsis, honestly), with tufts of grass, twigs, faux pheasant feathers, mini pumpkins and chinese lanterns in shades of olive, yellow and red. Plus leaves and fern fronds all bundled together with a cheerful, hand tied rust burlap bow. Measures approximately 24″ tall, 20″ wide and 6″ deep (with a few wispy tendrils that extend beyond those measurements.). This item is made to order, so final measurements may differ slightly in the finished product. You can also buy the florals and greenery to make this wreath yourself! Find them here. Just add a grapevine base and your favorite ribbons.